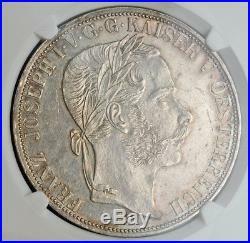 1867, Austria, Franz Josef I. Rare Silver 2 Thaler (Doppeltaler) Coin. 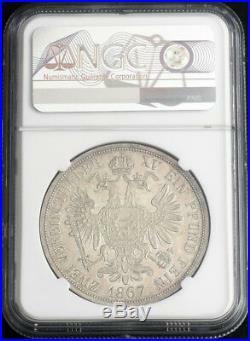 Mint year: 1867 Mintage: 8,300 pcs. Mint Place: Vienna (A) Reference: KM-2250. 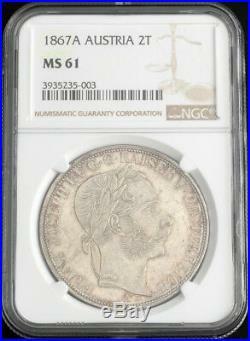 Certified and graded by NGC as MS-61! 900 Weight: 37.04gm Diameter: 42mm. Obverse: Wreathed mature head of Franz Josef right. Reverse: Imperial double-headed eagle with shield with coat of arms at chest, holding sword, imperial scepter and orb. When the Gulden was decimalized in 1857, new coins were issued in denominations of ½ (actually written 5/10), 1, 2 and 4 Kreuzer in copper, with silver coins of 5, 10 and 20 Kreuzer, ¼, 1 and 2 Florin and 1 and 2 Vereinsthaler and gold coins of 4 and 8 Florin or 10 and 20 francs. The last significant Habsburg monarch. Franz Josef was the eldest son of Archduke Franz Karl (Francis Charles), who was brother and heir of Austrian Emperor Ferdinand I. Because his father renounced his right to the throne, Franz Josef became emperor when Ferdinand abdicated near the end of the revolution of 1848. By the time Franz Josef stepped onto the throne, Austria's position as a European "great power" was already in serious decline. Three external factors furthered Austria's decline. Lingering Russian ill will was a factor in the July (1914) Crisis which led to the outbreak of WWI. - The unification of Italy provided a new threat to the empire. In the decade that followed, Austria lost nearly all of its Italian possessions, such as Lombardy and Venetia. - The rise of Prussian dominance of the German Confederation, and Austria's loss of the Austro-Prussian war in 1866. German unification in 1871 made Austria the lesser of the two German powers. Austria was weakened by these reverses. Franz Josef had little choice but to negotiate with Hungary on its demands for autonomy. Austria and Hungary agreed to create a dual monarchy in which the two countries would be equal partners. Under the empire of Austria-Hungary, as it was known after 1867, Hungary had complete independence in internal affairs, but the two countries acted jointly in foreign affairs. (This fact contributed to the slowness of A-H's response to the murder of Franz Ferdinand). The same year, Franz Josef and Elizabeth were formally crowned king and queen of Hungary. Franz Josef married Elizabeth, daughter of Duke Maximilian of Bavaria, in 1854. They had one son, Rudolf, and three daughters. As the dual monarch, Franz Josef planned to grant some form of self-government to the Austrian Slavs, but the German and Magyar elites who actually controlled the empire opposed any sharing of power. The resulting dissatisfaction among Austrian Czechs and Serbs further weakened the Habsburg realms and caused increased friction with Russia, which championed the cause of Europe's Slavic peoples. Franz Josef's later years were marked by a series of tragedies in his family. In 1894 his only son and heir to the throne, Archduke Rudolf, committed suicide; Franz Josef's second younger brother, Karl Ludwig, had died in 1896 from illness due to bad water he drank while on a holy lands pilgrimage; in 1898 Elizabeth was assassinated by an Italian anarchist. Succession to the Austrian throne was not simple. Following the suicide of Franz Josef's only son Rudolf, the next in succession would have been Franz Josef's younger brother Maximillian. Maximillian, however, had been executed by a firing squad in Mexico in 1867 after a 3 year reign as Emperor of Mexico. Karl Ludwig's oldest son, Franz Ferdinand replaced Rudolf as heir to the throne. Franz Ferdinand was assassinated by a Serbian nationalist in Sarajevo in June 1914. The assasination precipitated a crisis which led to the outbreak of World War I.
Franz Josef died on November 21, 1916. He did not live to see Austria's defeat in the war. His grand nephew, Karl I assumed the throne for two years, but was the last Habsburg monarch. William served in the army from 1814 onward, fought against Napoleon I of France during the Napoleonic Wars, and was reportedly a very brave soldier. He fought under Blücher at the Battles of Waterloo and Ligny. He also became an excellent diplomat by engaging in diplomatic missions after 1815. During the Revolutions of 1848, William successfully crushed a revolt that was aimed at his elder brother King Frederick William IV. The use of cannons made him unpopular at the time and earned him the nickname. In 1857 Frederick William IV suffered a stroke and became mentally disabled for the rest of his life. In January 1858 William became Prince Regent for his brother. On January 2, 1890 Frederick William died and William ascended the throne as William I of Prussia. He inherited a conflict between Frederick William and the liberal parliament. He was considered a politically neutral person as he intervened less in politics than his brother. William nevertheless found a conservative solution for the conflict: he appointed Otto von Bismarck to the office of Prime Minister. According to the Prussian constitution, the Prime Minister was responsible solely to the king, not to parliament. Bismarck liked to see his work relationship with William as that of a vassal to his feudal superior. Nonetheless it was Bismarck who effectively directed the politics, interior as well as foreign; on several occasions he gained William's assent by threatening to resign. In the aftermath of the Franco-Prussian War William was proclaimed German Emperor on January 18, 1871 in Versailles Palace. The title "German Emperor" was carefully chosen by Bismarck after discussion until (and after) the day of the proclamation. William accepted this title grudgingly as he would have preferred "Emperor of Germany" which, however, was unacceptable to the federated monarchs, and would also have signalled a claim to lands outside of his reign Austria, Switzerland, Luxemburg etc. The title "Emperor of the Germans", as proposed in 1848, was ruled out from the start anyway, as he considered himself chosen "by the grace of God", not by the people as in a democratic republic. This Empire was a federal state; the emperor was head of state and president. First among equals of the federated monarchs (the kings of Bavaria, Württemberg, Saxony, the grand dukes of Baden and Hesse, and so on, not to forget the senates of the free cities of Hamburg, Lübeck and Bremen). On May 11, 1875, Max Hödel failed in an assassination attempt on William in Berlin. A second attempt was made on June 2, 1875, by the anarchist Karl Nobiling, who wounded William before committing suicide. These attempts became the pretext for the institution of the Anti-Socialist Law, which was introduced by Bismarck's government with the support of a majority in the Reichstag in October 18, 1875, for the purpose of fighting the. The laws deprived the Social Democratic Party of Germany of its legal status; they prohibited all organizations, workers' mass organizations and the socialist and workers' press, decreed confiscation of socialist literature, and subjected Social-Democrats to reprisals. The laws were extended every 2-3 years. Despite this policy of reprisals the Social Democratic Party increased its influence among the masses. Under pressure of the mass working-class movement the laws were repealed on October 1, 1890. In his memoirs, Bismarck describes William as an old-fashioned, courteous, infallibly polite gentleman and a genuine Prussian officer, whose good common sense was occasionally undermined by "female influences". The item "1867, Austria, Franz Josef I. Silver 2 Thaler (Doppeltaler) Coin. NGC MS-61" is in sale since Monday, July 2, 2018. 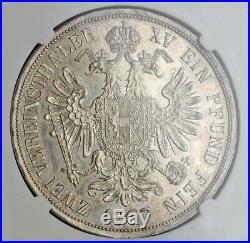 This item is in the category "Coins & Paper Money\Coins\ World\Europe\Austria". The seller is "coinworldtv" and is located in Europe. This item can be shipped worldwide.